I write to encourage you to review and reconsider your endorsement of Chuck Hagel as secretary of defense. The new information that has appeared since your meeting with him on Jan. 14 suggests that his weak policies vis-à-vis Iran and his reprehensible views toward Israel run even deeper than we realized at that time. We now know that he referred to Israel's self-defense in 2006 as a "sickening slaughter." That he preposterously stated in 2007 that "The State Department has become adjunct to the Israeli Foreign Minister's office." That he obnoxiously said in 2010 (according to a paraphrase) that Israel was "risking becoming an apartheid state." 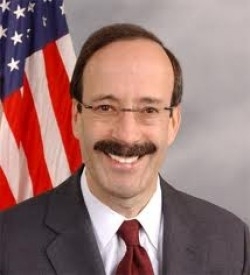 Rep. Eliot L. Engel (New York) was the rare Democratic elected official to come out against the Hagel nomination. Rep. Eliot Engel has characterized Hagel's outlook as having "some kind of endemic hostility toward Israel." I have written that Hagel "is known for only two foreign policy/defense views: being soft on Iran and hostile to Israel." Chuck, you and I go back to our many long dinners and debates in the college dining room in the late 1960s, when your sensible moderation first became evident. A hallmark of your career since then has been consistently to show good sense and courage on Middle Eastern issues. As you noted with pride in an April 2010 interview, your family name "comes from the word shomer, which means guardian" in Hebrew. You mentioned that your ancestors were guardians of the Jewish ghetto in the Ukraine, adding: "I believe HaShem [God], actually, gave me my name, as one of my roles that is very important in the United States Senate is to be a shomer for Israel. I will continue to be that with every bone in my body." You expressed having had "genuine concerns" about Hagel prior to your White House meeting with him; now is the moment for you to follow the dictates of your conscience. I hope you will now come out against the Hagel nomination, a shift that will have profound repercussions for the country and secure your reputation as a shomer for U.S.-Israel relations. 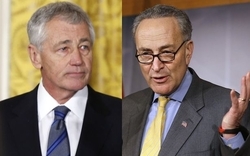 Feb. 20, 2013 update: At a breakfast meeting today (reported on by the Wall Street Journal and Politico), Schumer stood by and doubled his support for Hagel. He recalled that during their 90-minute meeting, he asked Hagel "about all the things he said that had troubled me, troubled you, troubled any of us who are supporters of Israel. He answered them very well." On the topic of Iran getting nuclear weapons, Schumer now recalls that Hagel replied "it would be devastating for the U.S. and for Israel, and the military option is one he would recommend being used if, God forbid, sanctions failed." The senior senator from New York concluded: "He struck me as sincere." Schumer also recalls having brought up Hagel's use of the phrase "Jewish lobby." I told him what a double standard [that] is. That Jewish people throughout the centuries have suffered a double standard. Everyone could be a farmer except Jewish people. Everyone could live in Moscow except Jewish people. I said, when everyone else can lobby, but all of a sudden when those of us who are pro-Israel [decide to] lobby it's a negative - that's a double standard. And I'm sure you [i.e., Hagel] didn't mean it, but it harkens to the old days. He almost had tears in his eyes when he understood that. So I believe that he will be good. Shockingly, Schumer concludes from this, "I think he'll surprise you on the issue of Israel, how strong he is." All of which confirms and extends what Schumer said at the time of his January meeting, that Hagel "realizes the situation in the Middle East has changed, with Israel in a dramatically more endangered position than it was even five years ago. His views are genuine, and reflect this new reality." The main fight on Hagel is coming from the neocons, who you know well. And they resent Hagel's apostasy on Iraq. You may remember — the neocons helped push Iraq — and Hagel was one of the first Republicans to say Iraq wasn't working. And he was right. But that's where it's coming from. Residual resentment about Iraq certainly exists, but that is far from the main issue today. Schumer summarized his statement with: "So I have no qualms about my position." Comments: (1) Well, there goes my initiative. (2) A 90-minute meeting undoes years and maybe decades of heated rhetoric, not to speak of a month's worth of new information? Impressive how convincing Hagel's confirmation conversion has been. (3) Sadly, Schumer has permanently tied his reputation to Hagel's.